↑ "Reports". WorstPolluted.org. Archived from the original on 11 August 2010. Retrieved 2010-08-29. ↑ "7 million premature deaths annually linked to air pollution". WHO. 25 March 2014. Retrieved 25 March 2014. ↑ "Air Pollution Causes, Effects, and Solutions". National Geographic. 9 October 2016. ↑ Johnson, Keith (18 April 2009). 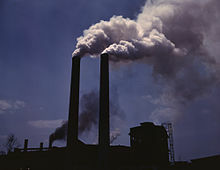 "How Carbon Dioxide Became a 'Pollutant'". Wall Street Journal. ↑ "Newly detected air pollutant mimics damaging effects of cigarette smoke" (PDF). Retrieved 2010-08-29. ↑ "Infant Inhalation Of Ultra-fine Air Pollution Linked To Adult Lung Disease". Sciencedaily.com. 2009-07-23. Retrieved 2010-08-29. ↑ "Air quality and health". www.who.int. Retrieved 2011-11-26.